The client contacted us as the existing ageing solution was not optimal. The reliance on projectors to display an image on the interactive whiteboard (IWB) had led to unforeseen downtime due to lamp failures. The loss of an IWB during term time has a direct impact of the students as lesson plans need to be adapted or the timetable altered. Due to the separation of the equipment the IWB often would require calibration in order for the staff to be able to accurately write or interact with the software displayed. Being a single form primary establishment, budget is always a high priority. However, the client understands that it is important to strike a balance between cost and performance. The life expectancy and aftersales support is also key as an investment of this size needs to last. The systems will be installed in classrooms full of children no older than 11 so need to be able to take the occasional impact yet respond to tiny hands. The classrooms at Chambersbury are well lit and of a good size so the final solution needs to be bright and clearly visible from the back of the rooms. The current SMART IWBs are used with the SMART Notebook software. With moving to a new platform, staff CPD training would be required to get the most out of the new equipment. After discussing the requirements with the Head Teacher, Des Taylor, we contacted the vendors most appropriate for the opportunity. We then shortlisted these products and arranged for no obligation demonstrations to take place on site at a time convenient to the school. The 2 front running products were from Genee and Promethean. Both panels had similar features. Full HD displays, bright tough panels and built in Android platforms. After further discussion with the school the 70” G-Touch Deluxe from Genee was selected. Despite the slightly higher initial cost the inclusion of a perpetual site licence for the SPARK whiteboard software and the included “Get Going” CPD training were the deciding factors. To minimise disruption to the school the installation was carried out over the October Half Term break. Beebug arranged for the Genee products to be delivered to the school prior to the break to ensure delivery was successful and so that the process could begin on time. The work included the removal of the old ceiling mounted projectors and SMART IWBs. The school had opted to retain the old equipment with a view to passing this on to other establishments in the local area. Beebug engineers stripped out the old equipment in each room and moved it to the store room designated by the school. The new Genee interactive Flat Panel Displays (iFPD) were installed so that the bottom edge of the screen was the same height as the IWB they were replacing. Beebug used high quality mounts from leading manufacturer Chief to ensure a secure fitting that will stand the test of time. To aid connectivity modular AV wall boxes were installed along with cable management to provide a neat, consistent look to the classrooms. The AV wall boxes allowed for modern HDMI connections as well as legacy VGA and 3.5mm audio jacks. They also provide a termination point for the USB cables required for interactivity. These were connected to the digital outputs of the classroom computers to help make the most of the new full HD displays. Although the Genee panels speakers are certainly loud enough to fill a room, the Chambersbury classrooms already had good quality wall mounted speakers with desktop amplifiers that provided a superior sound. The Beebug engineers wired in the audio output of the Genee iFPDs to pipe all audio from the screen (HDMI, Analogue or from the built-in Android platform) out to the amplifiers. In some cases, minor rewiring was undertaken to make sure the speakers were optimally configured. 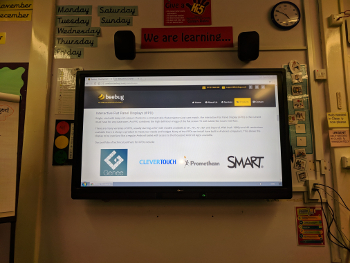 As a final part of the installation process the Beebug engineers installed the SPARK software and drivers on the fixed classroom PCs and joined the Genee Android systems to the school wireless network. This small step helped the school get the value of the screens from the first lesson. The school are very happy with their new equipment. The new iFPDs are working flawlessly. The “Get Going” training has been booked in for the 15th November. Chambersbury know that if any issues should arise Beebug are just a phone call away and Genee’s first class 5-year onsite warranty gives them total peace of mind. If you would like to speak to us, pick up the phone or drop us an email, we will be pleased to help.